On display at the Royal Ontario Museum until January 28, 2018 is the Evidence Room. 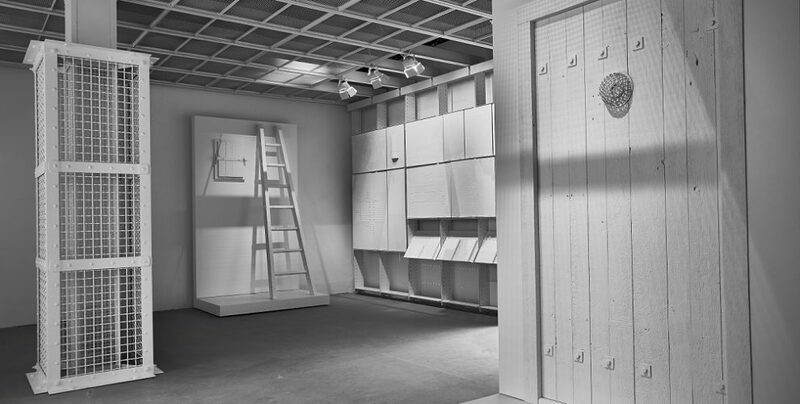 The exhibit depicts architect Robert Jan van Pelt’s detailed and important analysis of the Holocaust. Van Pelt, an architectural historian and founder of the science of forensic architecture who teaches at the University of Waterloo, had visited Auschwitz many times. His expertise was essential in winning a landmark case in a British court. In 1993, Professor Deborah Lipstadt of Emory University in Atlanta (with whom I once shared panel on a local Los Angeles television program) published the accumulated evidence that disputed the claims of Holocaust deniers, exposing them as historical revisionists and guilty of “purely anti-Semitic diatribe.” She titled her book Denying the Holocaust: The Growing Assault on Truth and Memory. Chief among the Holocaust deniers was David Irving who promptly sued Lipstadt for libel. The suit was filed in Britain where defending against libel is much harder than in the United States. Lipstadt and her publisher, Penguin Books, mounted a carefully crafted and vigorous defense that included van Pelt’s testimony. The ROM exhibit features the elements that van Pelt identified including the outside bolts that prevent those inside from escaping and four openings in the roof for administering poison gas shown as plaster casts prepared from photographs. The trial began in 2000. By the end of the trial not only was Lipstadt vindicated, the historical truth of the Holocaust was affirmed as indisputable fact in an open court of law. Further, the presiding judge publicly denounced David Irving. But this is not the end of the story. Sadly, Holocaust revisionism did not die. In fact, if Irving – now age 79 – can be believed, a new generation of followers has been spawned with many young people watching with rapture the several hundred on-line videos that Irving has posted. Just as Israeli justice Hadassa Ben-Itto says of the “Protocols of the Elders of Zion,” Holocaust denial is “the lie that wouldn’t die. All the more important, then, for visiting the Evidence Room and complimenting the Royal Ontario Museum for its fortitude and devotion to truth. It is devotion to truth that is particularly required in these times when alternative facts have gained a foothold.